Pieter de Bloot (1601-1658) spent all his life in Rotterdam. He specialised in landscapes in Jan van Goyen's style and taverns scenes reminiscent of Adriaen Brouwer's work. His production is considered of uneven quality although it can reach some high degree of refinement. This painting, formerly ascribed to Philips Koninck, has been attributed to Pieter de Bloot by H. Gerson in 1934. The picture bears in fact many similarities with de Bloot's style. Pieter de Bloot was famous for his stable interiors, a subject quite specific to the city of Rotterdam but he also painted many versions of outdoor peasants' scenes such as the present one. The little beggars, set in a landscape reminiscent of Jan van Goyen's style, can be found in other compositions such as Outside an alms-house, The Fitzwilliam Museum, Cambridge or Scene at a fair, Museum Bredius, Gravenhage (Netherlands). In these paintings, the architectural setting forms an interesting stage for the scene that is represented. His golden earthy palette is generally enlightened by subtle touches of vivid colours such as the red tone of St Martin's cloak that echoes in the female beggar's shirt standing next to him, in the skirt of the female in the middle and eventually in the shirt of the female on the far right. This repetition leads the spectator's eye through the picture and enhances the sense of perspective of the whole composition. In this painting, St Martin on the far left cut his cloak in half to share it with a beggar while a crowd of crippled beggars witnesses the scene. Saint Martin was a soldier in Emperor Constantine's army (4th AC). While stationed in Amiens (France), he came across a beggar, naked and shivering by a cold winter day, and shared his cloak with him. That night Christ appeared to him in a vision, dressed in the parted cloak, and commended the young soldier for his charity. St Martin on horseback outside a half-ruined town is surrounded by beggars and cripples while he is dividing his cloak with a beggar standing near him. Historical significance: Originally called Philips de Koninck (1893 Catalogue, p. 181), this painting was recognized as a typical work of de Bloot by Horst Gerson in 1934. St Martin, at the far left, divides his cloak in half to share it with a beggar, while a crowd of crippled beggars witnesses the scene. Its golden, earthy palette is enlightened with touches of vivid colours, such as in the red of St Martin's cloak, which leads the eye through the composition. This work is typical of the few religious subjects painted by de Bloot, combining its religious theme with the imagery of his peasants' scenes, as does another of his religious paintings, Christ in the house of Martha and Mary (Museu Nacional de Arte Antiga, Lisbon). 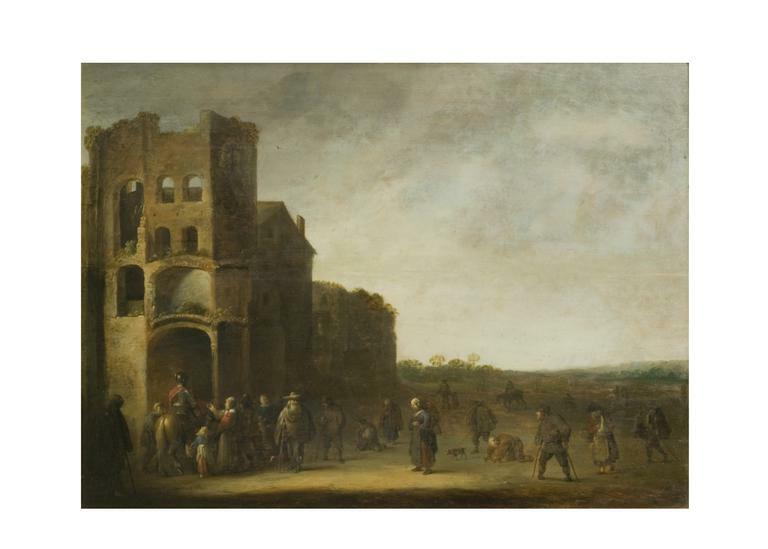 The beggars, set in a landscape reminiscent of Jan van Goyen, appear in other compositions such as Outside an alms-house, The Fitzwilliam Museum, Cambridge or in Scene at a fair, Museum Bredius, Gravenhage (Netherlands). The multitude of beggars and cripples in the scene of St Martin handing his cloak to the beggar is unusual, but it does occur in 16th and 17th century Flemish and Dutch art (for example: Brueghel school drawing, Montpellier, École de Médecine, no. 102; Abraham Govaerts drawing Stockholm, Nationalmuseum; J. C. Droochsloot, 1623, Amsterdam, Rijksmuseum; M. Stoop, Utrecht, Central Museum). De Bloot himself painted this scene more than once (Sale, Bangel, Frankfurt-am-Main, 12 Oct. 1926, lot 15). Pieter de Bloot (1601/02-58) was born in Rotterdam and lived there throughout his life. It is not known who were his teachers, but his interiors show the influence of Adriaen Brouwer and his landscapes that of Jan van Goyen. Saint Martin was a soldier in Emperor Constantine's army (4th AC), who, while stationed in Amiens (France), encountered a beggar, naked on a winter day, and shared his cloak with him. That night Christ appeared to him in a vision, dressed in the parted cloak, and commended the young soldier for his charity. Such peasants' interiors may have been introduced to Rotterdam by Francois Ryckhals, before being adopted by Cornelis and Herman Saftleven, the most famous exponents of this theme in Rotterdam. Pieter de Bloot was several years older, but his stable interiors are directly related to those of Cornelis Saeftleven. He also painted landscapes in the style of Jan van Goyen. Genre paintings, usually of peasants and the lower urban classes became increasingly popular throughout the 17th century in the Netherlands. It is unclear whether they embody metaphorical meanings or hidden messages, or simply seek to depict scenes of everyday life, usually in domestic interiors, or in the countryside. Dutch genre painting is closely related to popular literature and culture, especially proverbs. Unlike other Dutch artistic centres such as Haarlem, Utrecht, Leiden and Delft, Rotterdam had little stylistic cohesion, and most of its painters left the town early: Simon de Vlieger to Amsterdam, Herman Saeftleven to Utrecht, Willem Kalf to Paris and then Amsterdam, and Pieter de Hooch to Delft. The only genre specifically associated with Rotterdam is the peasant interior, usually of the cottage-and-barge type with strong still-life elements and known as 'stable interiors'. Christopher Wright, Dutch painting in the Seventeenth Century: Images of a Golden Age in British Collections, London, 1989, p. 171.